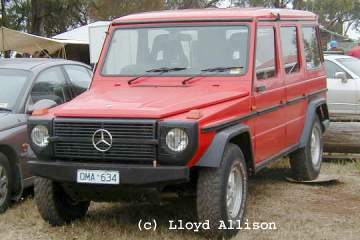 1979: The Mercedes Benz Gelaendewagen (cross-country car) was Mercedes' first attempt at a general four wheel drive. It was designed for Mercedes Benz by Steyr-Daimler-Puch (SDP) and initially built as a joint venture. Contrary to rumour, G-wagen is not short for Gucci-wagen. 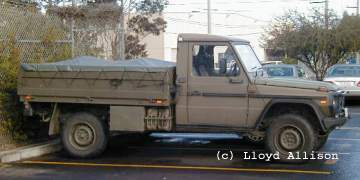 Steyr Daimler Puch are also creators of the capable but shall we say eccentric Haflinger and Pinzgauer 4×4s and 6×6s. The G-wagen engine options were: 2.4-litre 4-cylinder diesel, 3-litre 5-cylinder diesel, 2.3-litre 4-cylinder petrol and 2.8-litre 6-cylinder petrol. The G-wagen is very capable off-road with differential locks and all that but, at least in Australia, it was never the success that Mercedes Benz hoped for. Probably it cost too much for something that looked like a Land-Rover, not like a Range Rover nor a Discovery (which did not then exist), but a boxy series III. The G-wagen was sold as a Puch G-wagen in communist-block countries. In the late 1980s Mercedes Benz gave the G-wagen over to Steyr Daimler Puch, buying some back for rebadging. G-wagens were only briefly sold in Australia. Those that come on the market, particularly diesels, are often snapped up and shipped north to Queensland for outback and mining work because they have a good reputation for reliability. This Mercedes Benz Gwagen 290GD may well be unique in Australia. It was used as a trial vehicle for a Malaysian army contract a few years ago and subsequently became surplus to requirements. Being a right hand drive model, it was "donated" to Mercedes Benz Australian headquarters and is now used by JG for odd jobs. There are a few Gwagens locally but this one immediately stands out from any angle. From the front, the track is obviously wider than usual and the axles clearly heavier duty than those fitted to most civilian models. Both axles still have hydraulically operated differential locks that seem to be a Steyr trade mark. Tyre dimensions are 235/75 R 17.5 which work out at a nominal diameter of 31.4". This size, apparently quite common in Europe, is a tubeless equivalent of the trusty 750x16. From the side, the very long wheel base stands out. On top of the live axles, coil springs and full chassis, a very big drop-side tray is fitted. Something apparently so simple is still has many neat gadgets - functional catches, a foot-step in the tail gate, and the ability to fit a canopy and seats for up to 10 troops. A tool box and two jerry cans sit under the offside, the spare wheel under the nearside. A tray under the floor can carry hoops, canopy and equipment, and is accessed from the rear. The bodywork is all steel, although tapping on some of the panels sounds like fibreglass. It is painted in drab military green, so effective that JG has walked into it on dark nights. The motor is a 2.9-litre 5-cylinder diesel. (This has been superseded by a 3 litre unit in later models.) 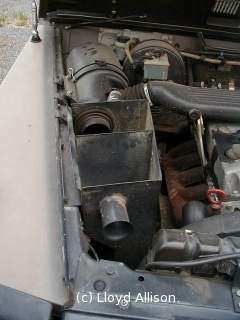 The air intake system features a water-dam box (right, with lid off) prior to the air cleaner and designed to stop water, or at least slow it down, before it can get into the filter, or worse into the engine. Like most military vehicles, the electrical system works on 24-volts, and tucked up under the dashboard is a military-style 2-pin socket that enables any vehicle to jump start any other vehicle. Also in fitting with the army role, there are strong "eyes" front and rear, for lifting by helicopter. The motor drives a part-time four wheel drive system and then the coil-sprung live axles with their diff-locks, as mentioned. The 290GD is no sports car, being geared and governed to 103km/h, but has plenty of low down torque. 1999 was the 20th anniversary of the Gelaendewagen. 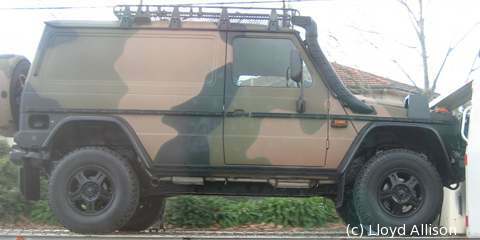 Australia saw G-wagens in the early 1980s, both for private buyers and also trying out for the Australian Army's Project Perentie which went to Land Rover (then in the form of JRA). 2000 September: An updated Mercedes Benz G-class (G-wagen) was shown at the Paris Motor Show, suggesting that there's a deal of life left in Mercedes Benz's older four wheel drive. There is new interior trim, a new dashboard, instrument panel and centre console. Engine options include a "V8 diesel engine (184 kW/250 hp) featuring common-rail direct injection, water-cooled intercooler and twin turbochargers which recently made its debut in the Mercedes-Benz S-class." Still on offer are the petrol 3.2-litre V6 in the G320, and 5-litre V8 in the G500. gvm, 4x4 4600kg, 6x6 6500kg. Deliveries started in Feb. 2010. From ~au$220K. (Land Rovers will be phased out by 2020.) -- Army newspaper, 13/9/2012. 2010, for civilians: 'The current 463-series "G" family has three body variants. The short wheelbase Station Wagon, the long wheelbase Station Wagon or the Cabriolet can be combined either with a ... V6 CDI engine developing 165kW (224hp) and 540 Nm, or a 5.5-litre V8 petrol engine with 285kW (388hp) and 530 Nm. The top-of-the-range G 55 AMG, which is available only as a four-door Station Wagon, is powered by a supercharged V8 engine generating 373kW (507hp) and ... 700 Nm.' -- [MB 2/2/2010]. 2011: G350 Bluetec 3-litre V6 turbo-diesel, from au$162K + orc! 2013: The G63 AMG 6x6, a three-axle vehicle. 2013, June 24: Deliveries to the ADF passed 1000. 2017: "The summer of 2017 saw the 300,000th G-Class roll off the assembly line in Graz — a Mercedes-Benz G500 ..." -- Daimler. 2018 January brought an all new G-class to the Detroit Motor Show, a strong visual resemblance to the previous model, still on a chassis, but introducing independent front suspension. The "G500" version has a twin-turbo 4-litre V8, from €107K+. consumption 9.8-9.6 l/100km, combined CO2 emissions 259-252g/km, claimed.